There are conventional ways of dealing with stress, maybe you signed up for a weekend seminar. The truth is one weekend is not going to change your life. So start seeking information that is inspiring vs. discouraging. “When I see negative content, especially violence, it sticks with me for a long time. Sometimes months” says Kyree. It’s true. Think about this scenario. If a bear was chasing you, there are two possible outcomes: you run away from the bear, or it eats you. Either way the stress response that was turned on, turns off. With negative input we keep the stress response on all of the time. Bottom line: positive thinkers cope with stress allowing for better innovation. We live in a society that has programmed us to respond to terms such as work ethic and return on investment. I believe this is true because individuals take pride in their work ethic. What about happiness? A study done by The Institute of Leadership and Management states that being happy at work can boost your performance and help to advance your career. “Negative is a choice. We choose what to put in our body or what to stimulate the body with” says Kyree. Choose your content wisely. Lead with optimism because teams that fully understand the purpose of what they do are more engaged than teams without this focus. Researchers Segerstrom and Sephton found that people who were optimistic about a specific and important part of their lives, such as how well they were doing in school, exhibited a stronger immune response than those who had a more negative view of the situation. Kyree reminds us that healthy habits do require repetition and he works diligently on this end result. “I love to affect change and make the people around me better!” says Kyree. By regularly taking in positive content there is a shift in the way events are perceived. You have an increased awareness of details that are positive in a situation. HYPERLINK “http://www.mayoclinicproceedings.com/content/77/8/748.full.pdf” A 30-year study of 447 people at the Mayo Clinic found that optimists had around a 50 percent lower risk of early death than pessimists. 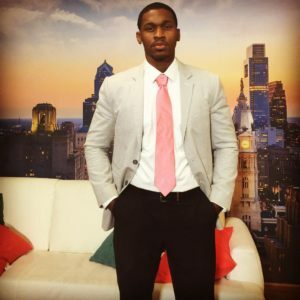 Kyree is a believer of the mind -body connection, he states “At My NEW Philly we believe that if you continue to show people positive essential news content, things that can make their lives better and make them a better person, they will continue to tune into this brand of news so long as they can see and understand the positive effects it has on their lives”. Positive people are able to maintain a broader perspective and see the big picture which helps them identify solutions whereas negative people maintain a narrower perspective and tend to focus on problems. How can you use My NEW Philly to turn on the positivity switch? “The news had sung the same song for ever, it’s time an alternative be born that helps you navigate your everyday happenings to their fullest potential and makes you want to share a positive entertaining story with the ones you love” says Kyree.